Cats are typically fuzzy, soft little creatures that enjoy a good snuggle (once in a while, on their terms)! The cats below are still very cute and friendly, though they lack one of the characteristics common to most cats: fur. 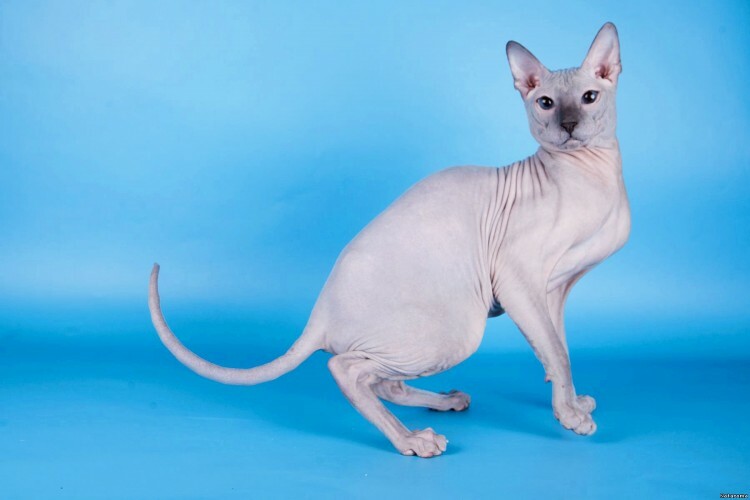 Cat breeders Kristen Leedom and Karen Nelson were the brilliant minds that came up with the Elf Cat – a hybrid consisting of the American Curl and the Sphynx. These adorable kitties have ears that curl back into “points” much like their elfin affiliates. You might be asking yourself: what’s the point in crossing a Sphynx with an American Curl anyways? I mean, besides the fact that it makes the cats extra cutie. Well, it’s actually much better for the cat! 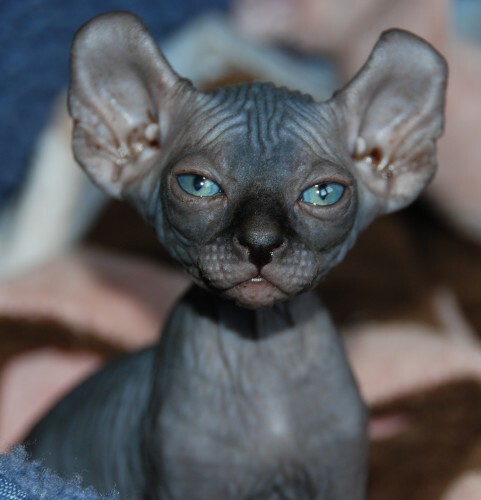 Sphynx cats can unfortunately have a lot of heart problems due to inbreeding. 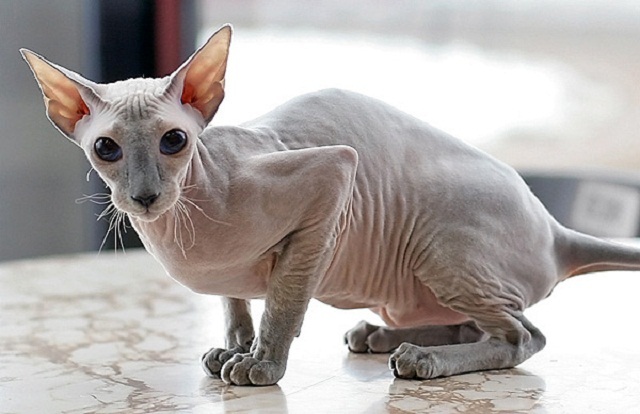 Mixing in the DNA of the American Curl can resolve this problem (though, usually not entirely) creating a much healthier kind of hairless cat. The crossbreeding process also produces a very smart, agile, and friendly cat that you’ll just want to snuggle forever (if they allow it, of course). 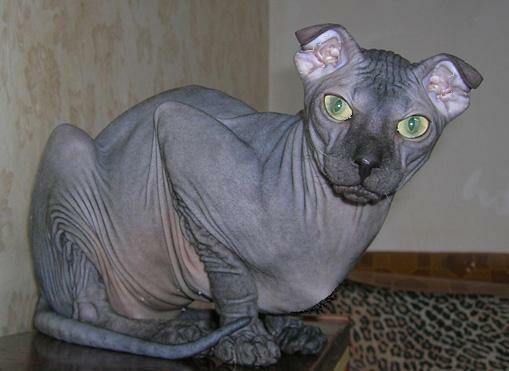 Hailing from the Ukraine is the Levkoy Cat (did you read that in a Ukrainian accent? Because you should have). 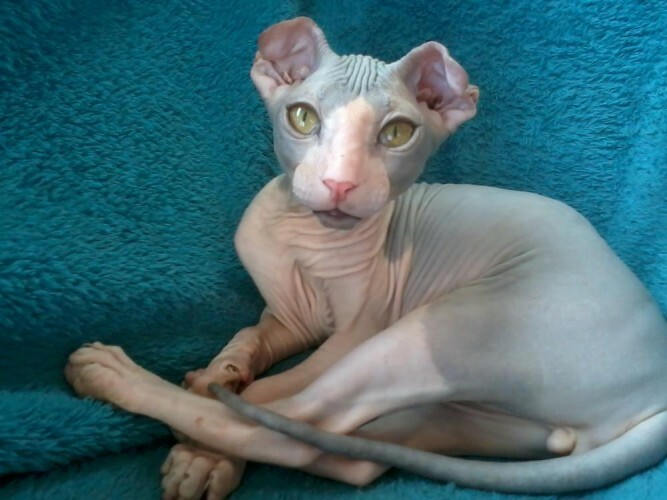 These are a mix between cats with folded ears (probably a Scottish Fold) and a hairless cat breed called the Sphynx. 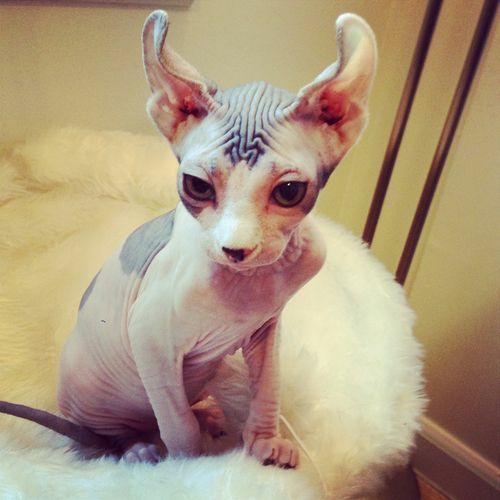 The result is a naked kitty with drooping ears. It is thought that their name was taken from the Levkoy plant which has leaves that resemble the Levkoy’s oddly folded ears. 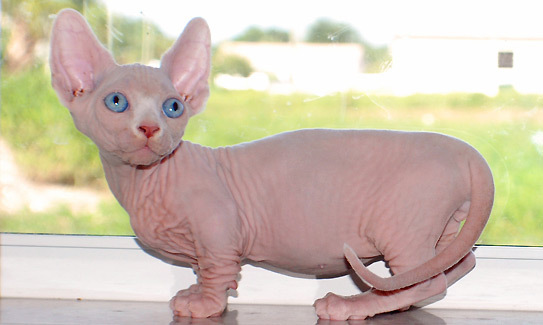 If you’re looking for a naked kitty with short, stumpy legs… then look no further! 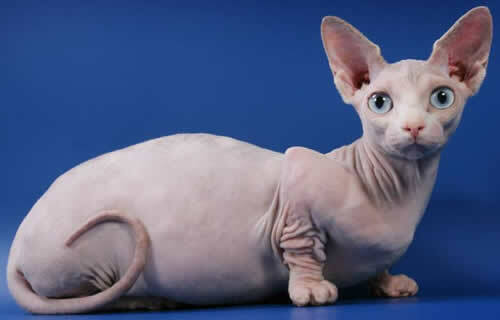 This is the Bambino, a result of a cross between a Munchkin Cat and a Sphynx. 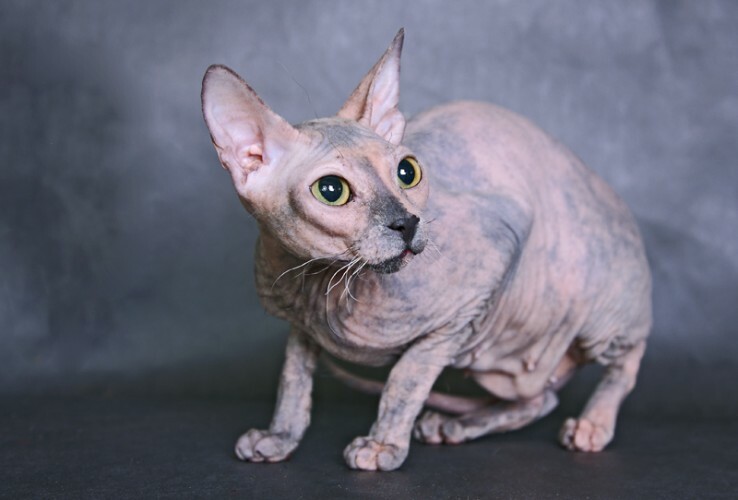 However, breeding for a very specific look (in this case a hairless cat with short legs) can lead to a lot of health issues. Aside from the heart problems that run in the Sphynxs’ family, they are also prone to periodontal disease, skin conditions, and more. 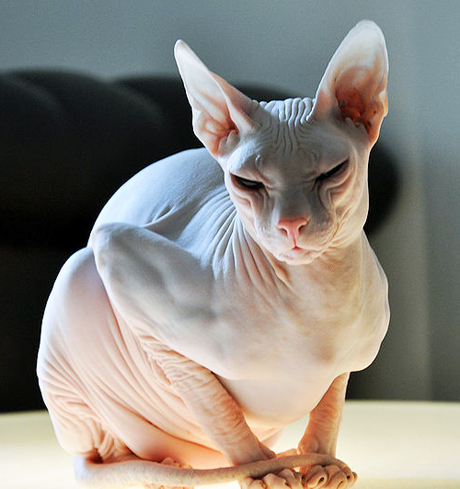 All of those are JUST from the Sphynx side! To make matters worse, the bambino’s squat stature comes from the Munchkin’s form of dwarfism, pseudoachondroplasia. While this type of dwarfism is naturally occurring, it’s still not *good* for the cat. Bambinos can’t jump as high as normal cats, and since they still have that cat instinct to want to jump, prowl, and play, this is very upsetting. All in all, while they may appear very cute, the bambino is not going to be dealt a good hand in the health department and should not be considered an ideal choice for a cat companion. 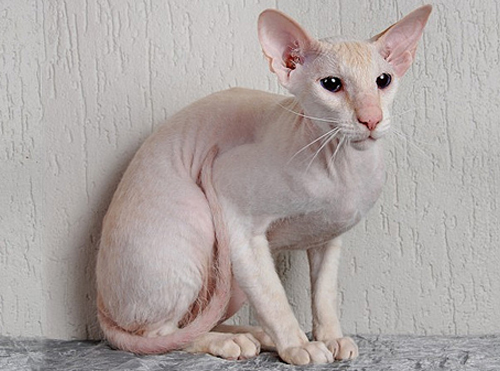 In 1994, Russia graced the world with the creation of the Peterbald – a hybrid between a Russian Hairless (Donskoy) and an Oriental Shorthair female. 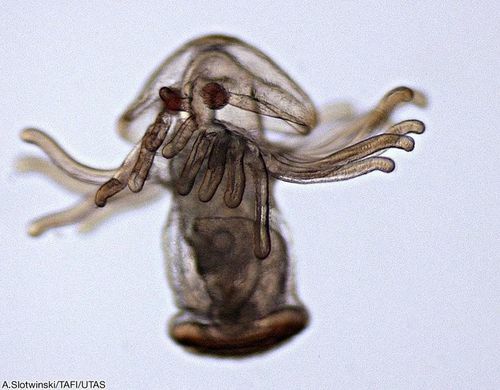 They have a narrow, long head, webbed feet and a long rat-like tail. Adorable, basically. 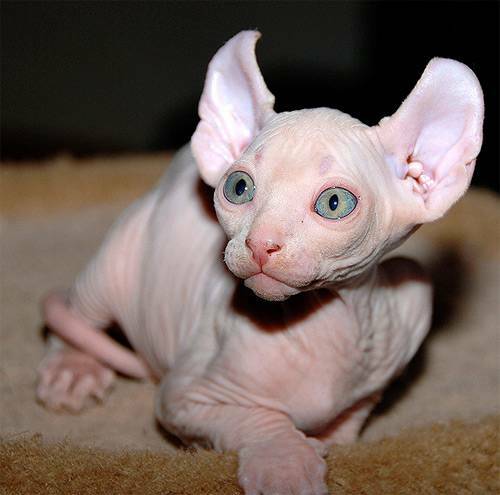 They may be completely hairless or they can have a thin, fine coat, much like the hair found on a peach. 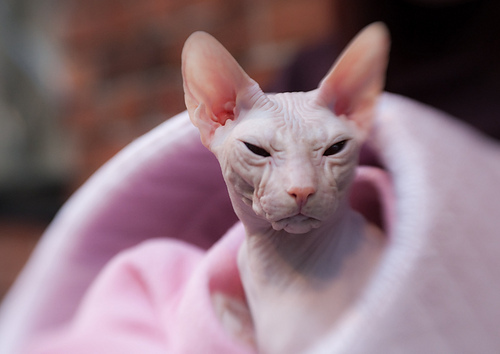 Peterbald cats are very active, playful, and friendly, unlike other cat breeds. Peterbald cat does not like being alone and so will require an owner that’s got time to spend with them! 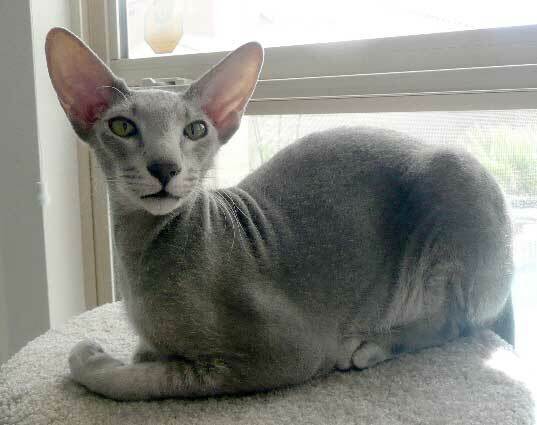 The Donskoy has a number of aliases including the Russian Hairless, Don Hairless, and Don Sphynx. 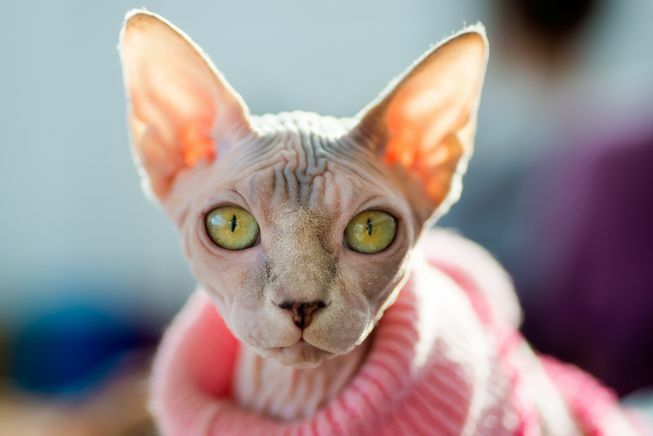 While this breed is typically confused with the Sphynx, it differs in its genetic makeup. 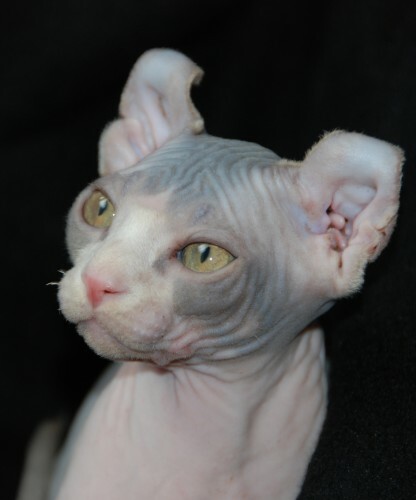 The Donskoy’s hairlessness gene is dominant (which makes for easier breeding) whereas the Sphynx’s is recessive. 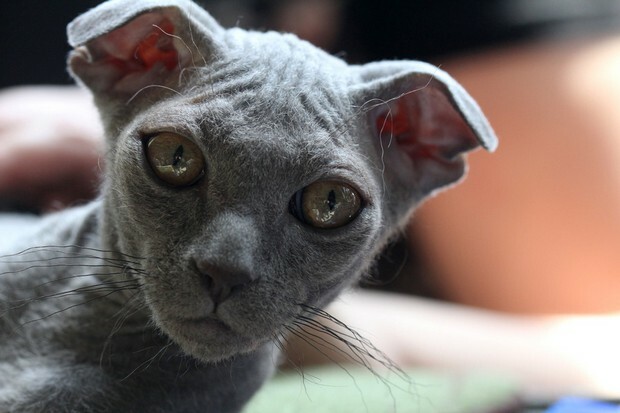 Donskoy cats are so loyal and affectionate that they are sometimes compared to owning a dog. They will follow you around and want to be with you at all times. It’s important to have the time to devote to such a loving creature, especially since they can live between 12-15 years. 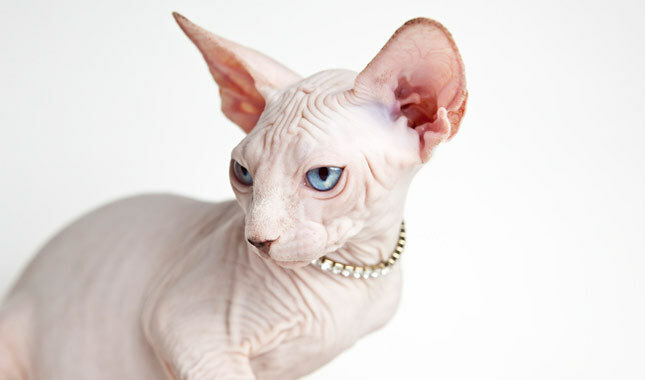 You can call it the Sphynx, the most famous hairless cat breed in the world. 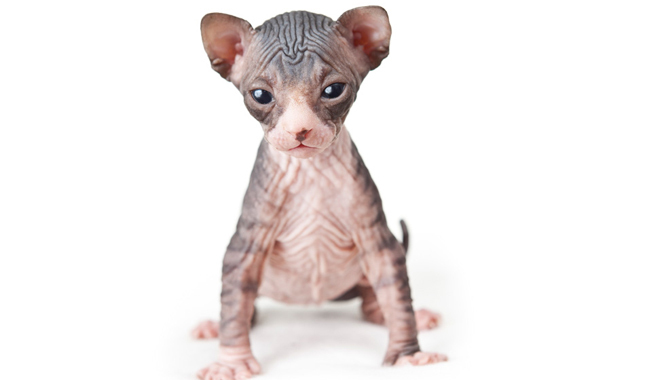 Originating in Canada in 1966 when a single hairless kitten named Prune was born. 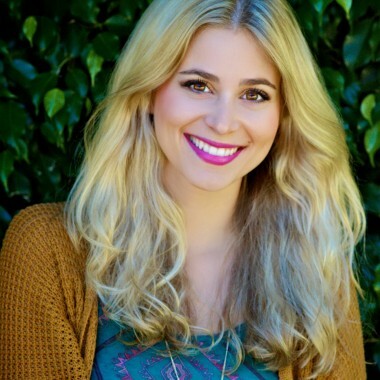 Awwww, Prune!! 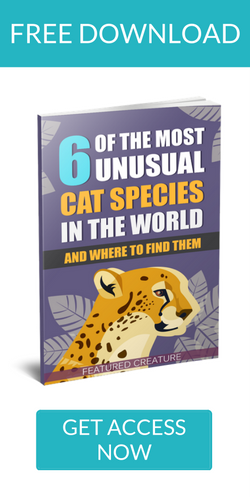 This cat species is found in various colors and patterns like cream, chocolate, white, black, cinnamon, spotted, patched, etc. Its color really depends on the pigment of the skin itself. 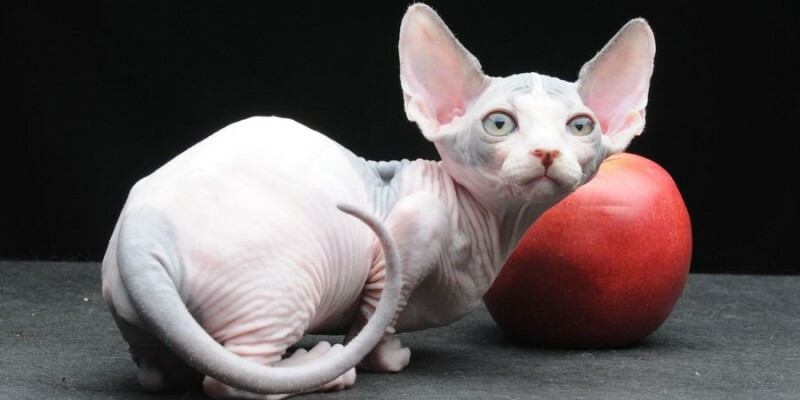 Like all of the cats on this list, Sphynx cats should be housed indoors as their sensitive skin does not have fur to shield it from harmful UV rays. 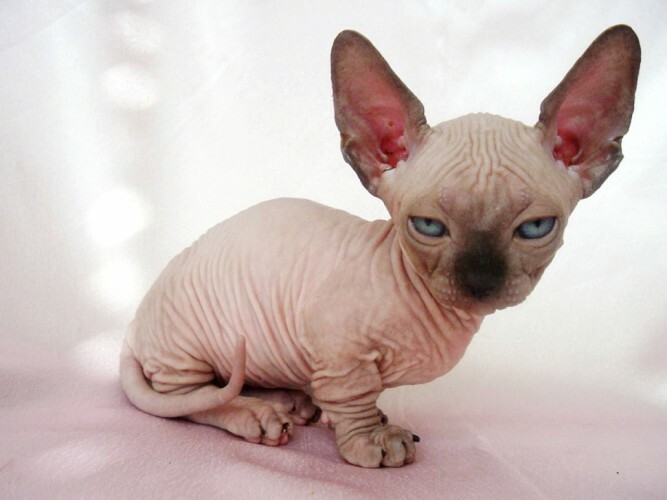 It’s also important to note that while these cats do not have fur, they still require grooming in the form of baths. 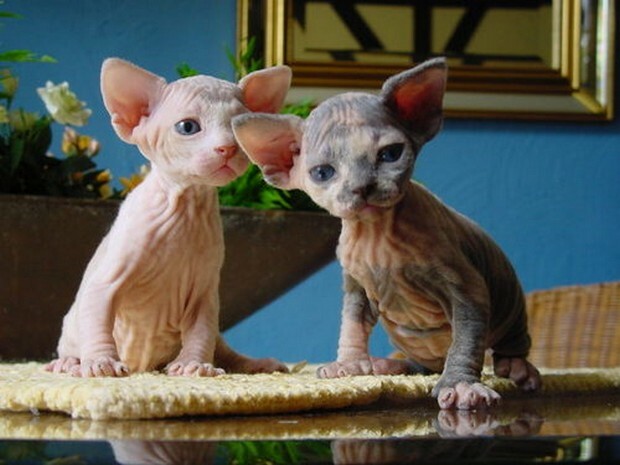 Sphynx cats should be bathed almost every week to get rid of the buildup of oil on their skin. Wax buildup in the ears should also be removed regularly. 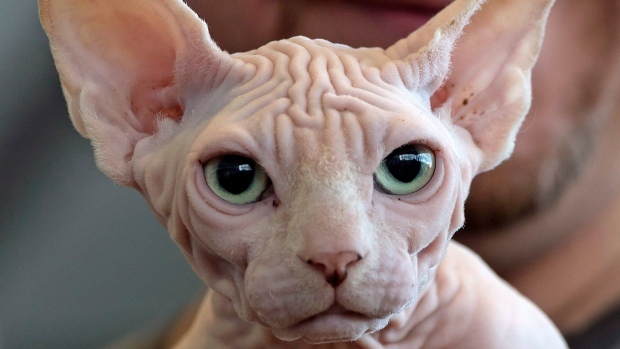 It seems like Sphynx cats get spa sessions more frequently than most humans do! 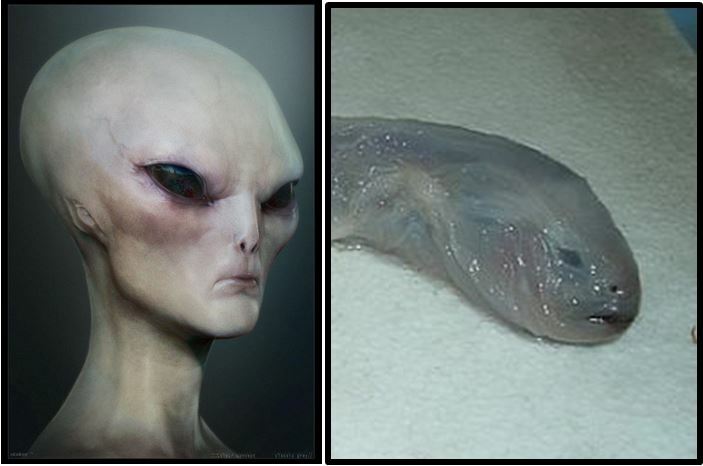 The Grey Alien LIVES! … Underwater as a Limp Eelpout, That Is. 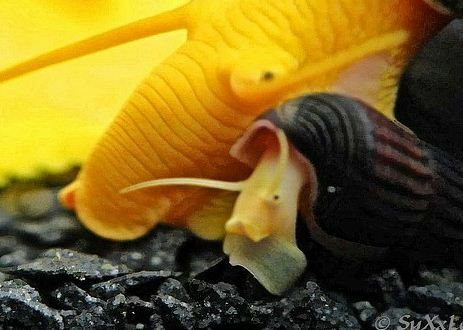 This Orange Elephant Snail Is the Cutest Mollusk You Will See All Day… Or Ever.